粘米粉 is rice flour, avaiblabe at Asian grocers. Hi it is really nice to see this! Could you please give me the recipes in English? I am trying to find these in an Asian market in U.S. I got one ice-skin mooncake recipe on my english blog here. Is is better to put them in the freezer not in fridge? 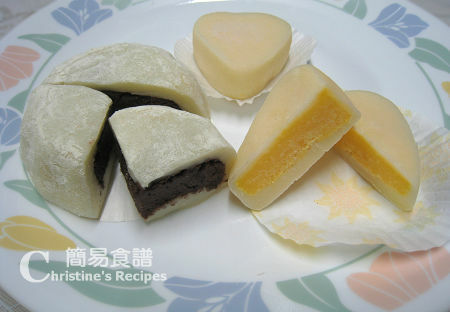 I put the mooncakes in the fridge, but after 2 days the mooncakes became very hard. So I microwave it for 10secs and the mooncake became very hot but part of the skin is still very hard. Should the mooncakes put into freezer instead? Chill them in freezer and store in air-tight container。 It helps them avoid from being dehydrated. When it's ready to serve, just transfer the mooncakes to the fridge for a while, they'd return soft. Store them in the freezer, if you want to keep for a period of time. When you'd like to have them, just transfer them to fridge for a while and they'd return a bit soft. hi, i want to make ice skin moon cake with cheesecake filling, but don't know how to make the cheesecake filling. Do you happen to know how to make cheesecake filling? 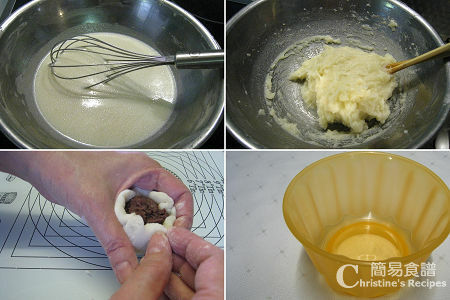 Is the ice-skin mooncake recipe in your english blog the same as the chinese recipe? btw, about how many pieces does your recipe make?